Last year, post Tomlinson, things had improved greatly, and I was pleased to find that again there were no problems this year. This was I think the best picture that I took on Saturday, although I didn’t spot it in my first quick look through the pictures when I selected twenty or so to upload to Demotix on Saturday night. But it’s certainly a picture that has grown on me since, starting with the word ‘CRUELTY ‘ in the top left and the distorted face below it (that distorted ‘R’ in the word helps too) then moving across to a second piece of text ‘Everyone Wants to Live‘ which perhaps asks rather more questions than it answers, then a group of three heads – a rabbit, a bear and a young woman whose megaphone both sweeps us on across the picture and for me links back to the open mouth at left. There is also something about the placement of the other figures that I think could hardly be bettered, both the two men standing at the right and the two women in the background at left, and the banners behind. I’m not sure that the hands of the man who is looking a his pictures on the back of his compact camera are really what I would have wished for (it looks to me as if he is rolling a cigarette), but for it’s perhaps something that illustrates the real power of photography, coming up with things I would never have dreamed of, and part of the kind of ordered chaos that makes taking pictures exciting. 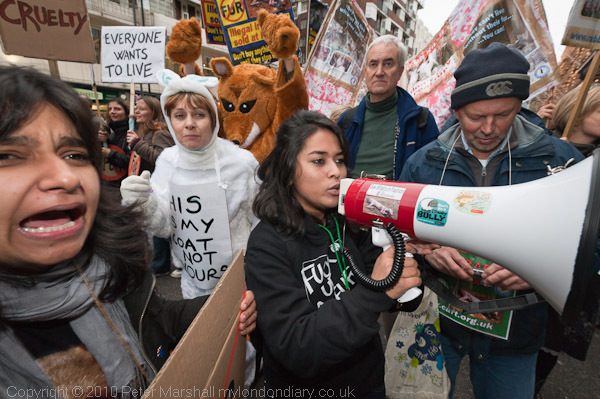 They are also a part of a kind of swirl of hands around this picture – I start from the upraised paws of that bear and my eye works round through the hands of the two women, the rabbit, a hand holding a cardboard placard, the hands on the megaphone and then on to those holding the camera. It also pleases me that this is exactly as I framed it in the camera – as indeed are most of my pictures, though I’m not a religious fanatic about it. Sometimes in the heat of the moment you don’t get it quite right, and I’ll happily shave off a few pixels if necessary. But this is exactly as I saw it. This was taken on the D700 with the 16-35mm zoom at its widest, and it isn’t often that I get an image that works as well across the whole frame with that extreme a wide-angle. The inherent distortion from such a wide view in a rectilinear lens helps her, exaggerating the pain and anger in the face at left and making what was a very large megaphone seem to loom even larger. Of course I didn’t stand there thinking about all these things when I took the picture – but I did recognise something that made me press the shutter. Of course I always (well, almost always) have a reason to press the shutter, but things seldom work out exactly how I want. But its all part of training the mind (the ‘eye’) along with looking at the results afterwards. And just sometimes the arrow hits the target. I can’t remember why I had the camera set to ISO360 at this point. There wasn’t a great deal of light and more typically I would have been giving myself at least a stop if not two more. I think I’d probably forgetten to reset it after taking a portrait earlier. But this was shot at 1/100 at f8, and everything is pretty sharp – 16mm gives fairly extreme depth of field. But the two closer figures, where fill-flash was more noticeable have just a slight, very slight suggestion of blur along with the sharp flash image. It isn’t visible at this scale, but I think helps prevent the scene looking static when viewed at a larger size. Using flash of course meant that the closer elements of the image were too bright as taken, and a little bit of burning down was needed. The flash is no longer obvious but it does really add to the picture. A’ bloody’ hand and a tatoo (upside down) that reads A. L. F.
Most of the other images I liked from the day were really of single figures or concentrating on a single figure in a crowd. 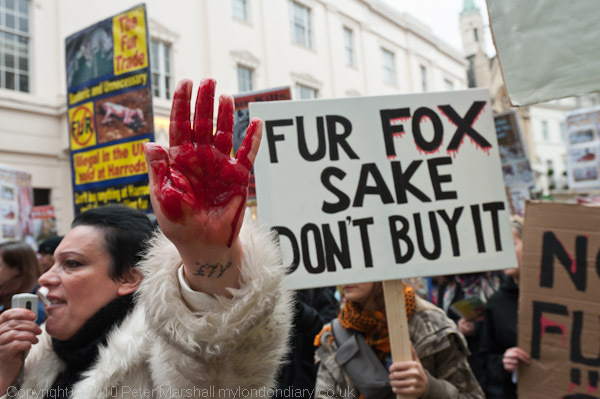 This image below was one, like the top picture taken outside Harrods, currently the only department store in the UK still selling fur, although the march organisers, the Coalition to Abolish the Fur Trade, have hopes that the new Qatari owners will end this when they fully take over in January. 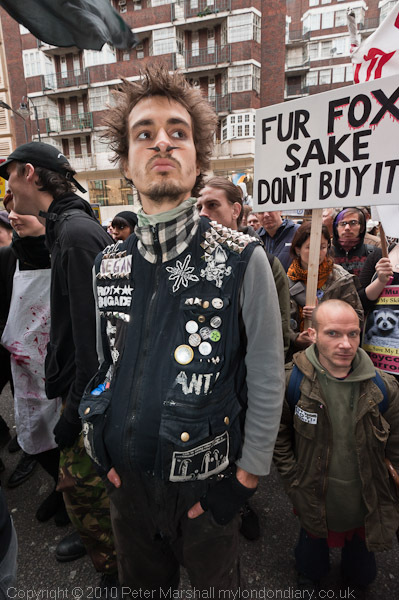 More about fur, the march and more pictures in National Anti-Fur March on My London Diary. This entry was posted on Tuesday, November 16th, 2010 at 10:47 am and is filed under My Own Work, Photo Issues. You can follow any responses to this entry through the RSS 2.0 feed. You can leave a response, or trackback from your own site.